The true charm of Android lies in its power of customization. While most other mobile platforms are closed to third-party modification of system files, Android is open to all kinds of custom development activities. 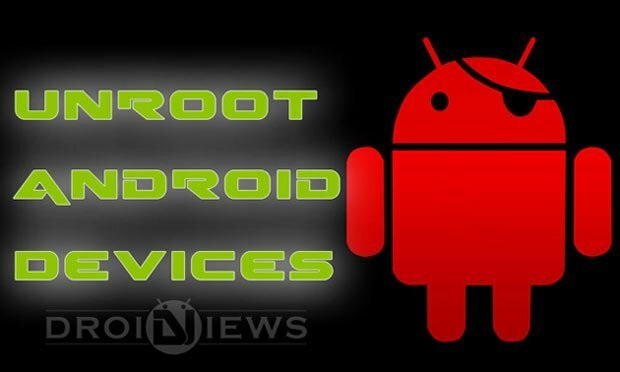 Having rooted your Android device you can modify its default settings, codes and graphics to get faster performance, better battery life, and UI customization. There is a large group of Android users who refrain from rooting their devices for fear of losing the warranty and putting it into risk in the procedure. Then there are others who find it hard to keep an unrooted device. Having once enjoyed the privileges of root access, one cannot live without it. 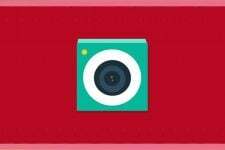 However, there are certain circumstances when you might consider unrooting your phone, especially if you want to claim the warranty and, in some cases, to receive OTA updates. 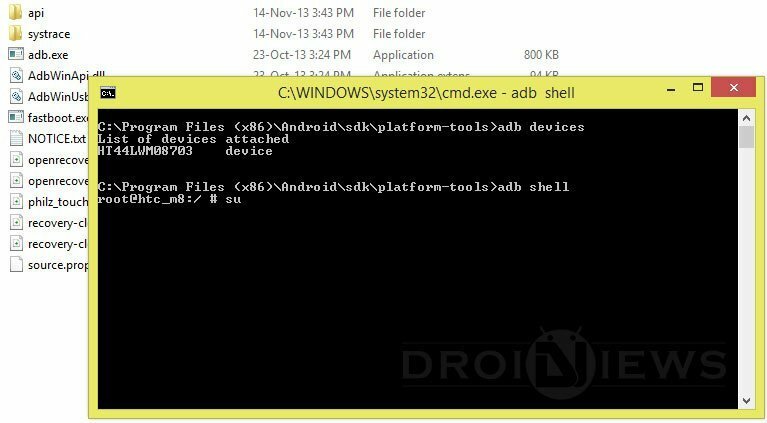 Whatever the case, if you want to unroot your Android device here is how you can do it. The most popular method used for unrooting Android devices is flashing the stock firmware not because it’s easy, but because people are hardly aware of other easier methods. Restoring a device to stock is certainly not an easy task and if you do not have a custom recovery installed, you do not need to download bulky firmware packages and make a lot of preparations. Now look for a file called su, press and hold it and select Delete option. If you do not find su file here, skip to the next step (I did not find this file on devices like LG G3 and HTC One M8 but it was present on NexuS 5. Then open /system/xbin/ folder and delete su file from here too. 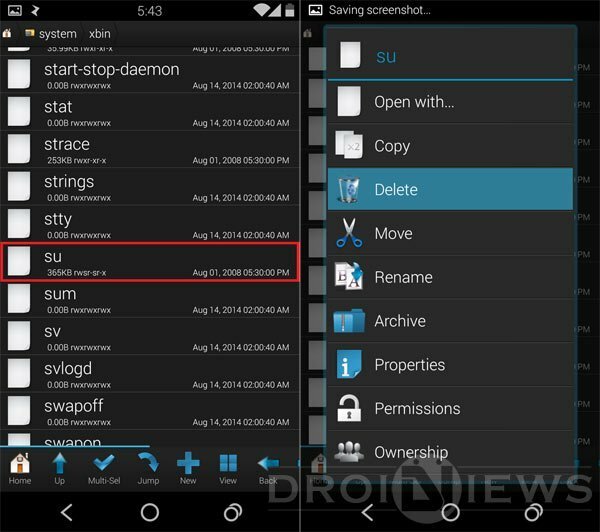 Having deleted that file open /system/app/ folder, look for Superuser.apk and delete it. Now exit Root Browser and reboot your device. Done! We just hope you found the above method easy but if that does not work for you, try something else from below. If you have not installed a custom recovery on your device and want to unroot it easily, you can do it from within the SuperSU app settings itself. Just open SuperSU app on your device. Scroll down to Full unroot option and tap it. 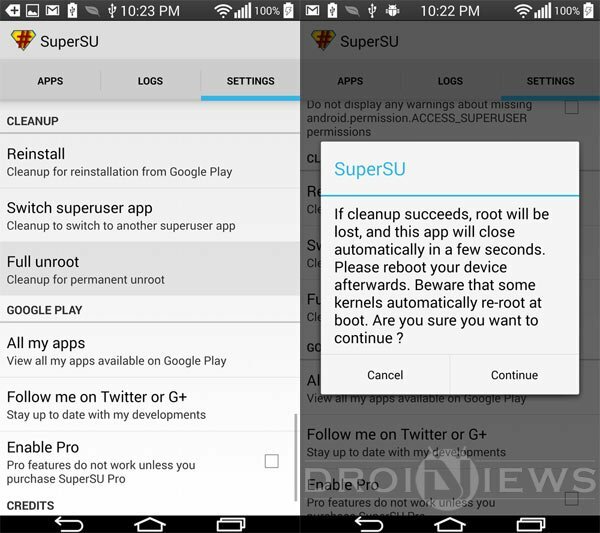 SuperSU will prompt you if you really want to continue with unrooting your device. Tap Continue. Now reboot your device and when it boots up, uninstall SuperSU app by selecting Uninstall option on the SuperSU app page on Google Play Store. 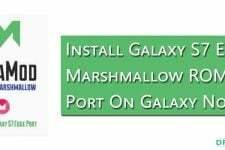 Your phone or tablet should now now be unrooted. Enjoy! If you are able to get software update notification from your device OEM while being rooted, just accept the OTA and install it. When the new software is installed, your device will lose root privilege. You can uninstall SuperSU/Superuser app after the software update is done. Please make sure not to take official OTA updates only if you device has a custom recovery like CWM or TWRP. To install the OTA software update successfully, you must have stock recovery. If you have downloaded the stock OTA update, here’s how you can check if your phone has been unrooted or not. It works only on rooted phones with stock recovery. You must have ADB and Fastboot on your computer to perform the commands. Check for system updates from Settings> About device> Software update, and download the update if it’s available. Wait until your device reboots. Now reboot your phone into the recovery mode. If you get “permission denied” or something like that as result, your device has been successfully unrooted. Your next step should be to uninstall the SuperUser app from your phone. The most popular way to unroot Android devices is flashing the stock/official firmware. This method works even on devices that have a custom recovery or kernel installed on them. Since a firmware is the full package containing all system partitions, it does not matter whether you phone has CWM/TWP or even a custom ROM on it. We have a good number of tutorials that will help you restore the stock firmware on your device. What about the flash counter reset? I tried method 3 then method 1. Had to do a back up. What’s your device model and Android version? well that was a waste. i found none of those files in my phone and yes my phone is rooted. Please help me. I’m in an urgent need. I own a Micromax A114 which runs on Android Jelly Bean. I wanted to upgrade it to latest Lollipop so i thought of installing custom ROM for that. I rooted my device and it showed no issues with it. Then i read about how to install custom roms. It said first to back up current rom by Clockworldmod and then installing the iso file of custom rom and then using any application for intsalling new rom and then rebooting it. I just did the first step, i.e. clocksworldmod and triewd to backup my current rom. io don;t know what after that but i cannot use my phone now. It gets rebooted after every 15 minutes and then gets back on after numerous efforts. It shows distorted screen as well. 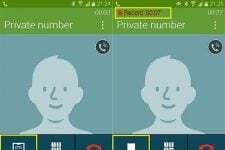 I tried factory reset my phone and it worsened the condition. Is there any way you can help me? I cannot to afford to buy a new smartphone. Please help. Hi, backing up a ROM does not cause bootloop. You must have made a mistake. Copy the downloaded ROM file (.zip) to the memory card, boot the device into CWM recovery and do a clean install. You phone should be fixed. I put it on charging and then try to turn it on but i’m unable to do so. I deleted the app that i installed for installation of custom rom and also to take backup of ROM. I was also trying to unroot the phone through Kingroot app that got installed automatically when i rooted the phone but it ran out of battery that time and now i cannot turn on my phone. Any other suggestion for my case?? problem is the binary counter. I have installed many galaxy s4 att i337 updates and my phone still says custom when I boot it up, Root checker says the phone is NOT rooted. I am running 4.4.2. Some apps I try to run even say sorry this app will not work on a rooted phone. But as I said Root Checkers say the phone is NOT rooted, but the boot screen says custom and shows the unlocked pad lock. any ideas? I want my phone back to normal. I guess it has some binary counter set from what I have read around the internet. I am afraid you can’t rever newer Samsung devdevices back to real “unroot”. You can unroot it but that binary counter you see upon reboot is there for good. It is due to knox, new security system Samsung has. Tripping knox can not be undone. If you want root i suggest you root it again. Devices without developer’s support are hard to pimp… did you upgrade to the latest version of software with that alcatel program? Which version are you on?